In this case, White-breasted Nuthatch (Sitta carolinensis) is the right-breasted nuthatch. In the Victoria checklist area, they are considered accidental according to the 2001 checklist and it's a bird I've always wanted to see locally. 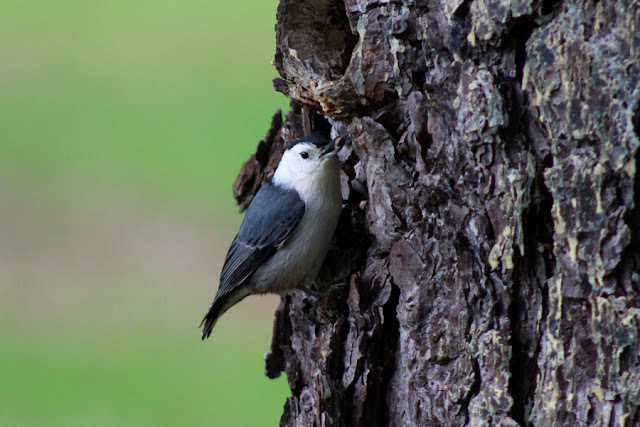 Imagine my surprise when I checked BCVIBIRDS midday on Friday and learned that Mike Shepard had found a White-breasted Nuthatch along Cedar Hill X Rd. near the Uplands Golf Club. Janean and I had to run a work-related errand in the Ten Mile Point area to finish our work day, so we made a quick attempt around 4 p.m. A birding army of three was already there doing their best to find the rarity from the east. We all put in a good effort, but we just couldn't turn any of the Red-breasted Nuthatches (S. canadensis) into the sought-after species. Janean had a running course and pottery the next day, so I decided to walk the 10 kilometres from Commonwealth Pool to the golf course. I managed to get back in the vicinity of the previous day's sighting by 11 a.m., which gave me more than an hour to search for the nuthatch. Mike McGrenere rolled up beside me on his bike while I was still walking and he slowed his pace to join me for the last half kilometre. We decided to split up to maximize the ground we were covering, but we were luckily spared our futile efforts when Jeff Gaskin popped out to advise us the bird was being seen along the edge of the golf course. 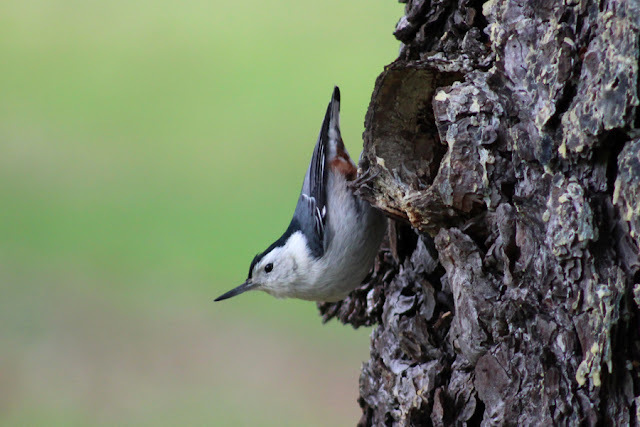 He led us along the fence that separates the golf course from a gated community and we soon saw Aziza Cooper and Mary Robichaud beaming as they watched the White-breasted Nuthatch clinging to the side of a pine tree. Rarities just don't get much more confiding, granted you can find it in the first place! Finally I have photos that I don't have to call "record shots"! 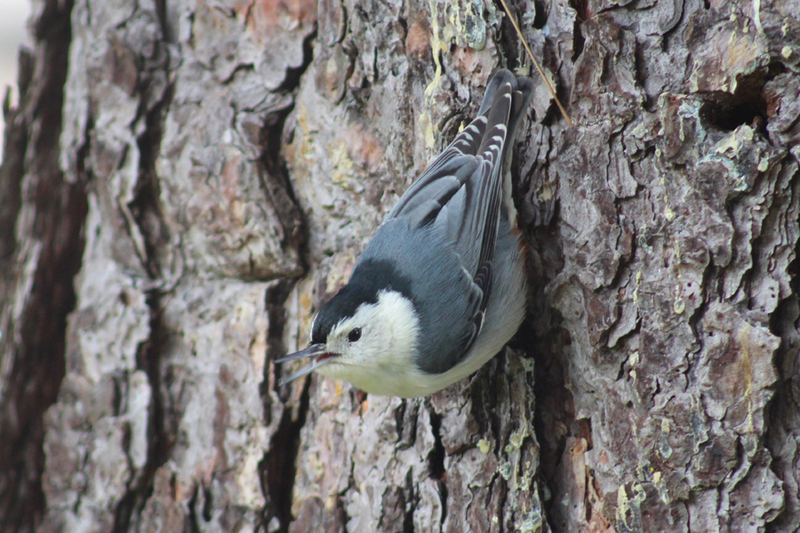 It looks like the White-breasted Nuthatch found a pine seed hidden in the cracks of the bark - score! As if seeing the White-breasted Nuthatch wasn't enough, the line of pines had some great bird activity. 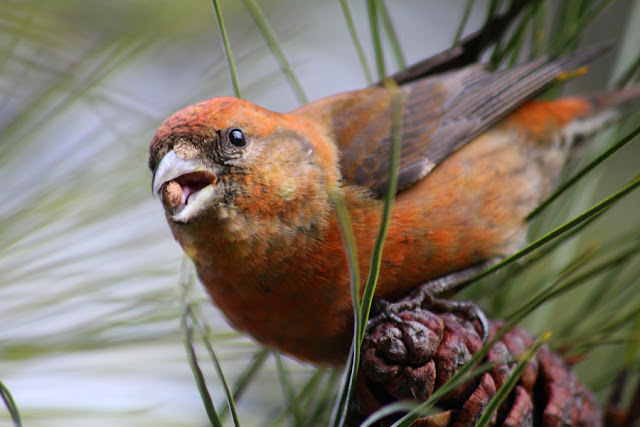 The added highlights were dozens of Red-breasted Nuthatches in the trees and on the ground and a flock of Red Crossbills (Loxia curvirostra) systematically stripping the pine cones of their seeds. I decided to try to get a photo of the crossbills and had the most amazing views of a few individuals that were so content feeding that they paid me no mind. In fact, one male dropped from a cone a few metres away to an even closer cone and then to another cone even closer still. I actually had to take a step back to be able to focus my lens! I also had a humorous event involving the Red-breasted Nuthatches when I noticed the White-breasted around 30 metres away. 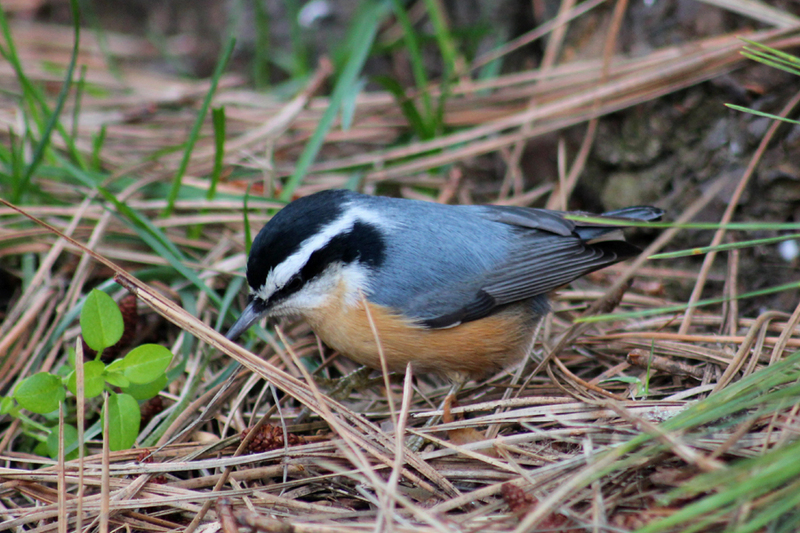 I decided to beeline to it and as I approached I had at least two Red-breasted Nuthatches fly out from under my feet! The pine trees were creating a buffet for several species and they were not about to let a few nosy humans stop them from capitalizing on it! This is just one example of the non-stop Red-breasted Nuthatch action going on under the pines. 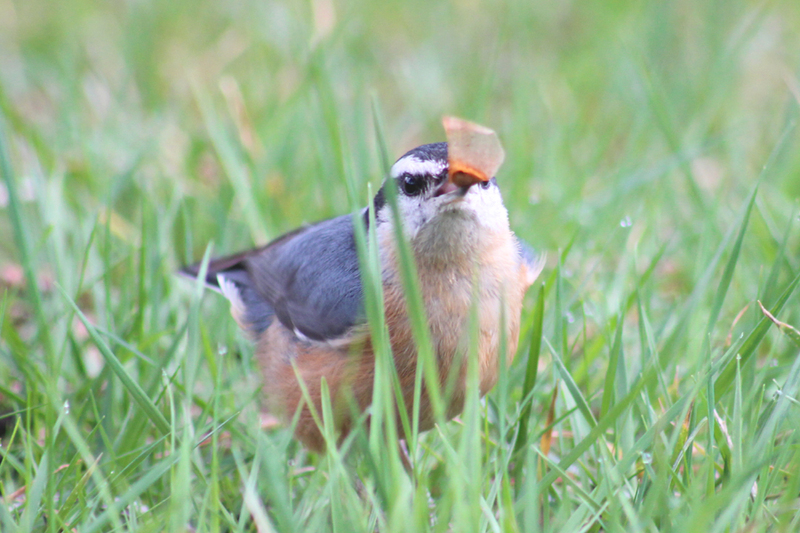 Here's another shot of a Red-breasted Nuthatch picking through the needle litter. 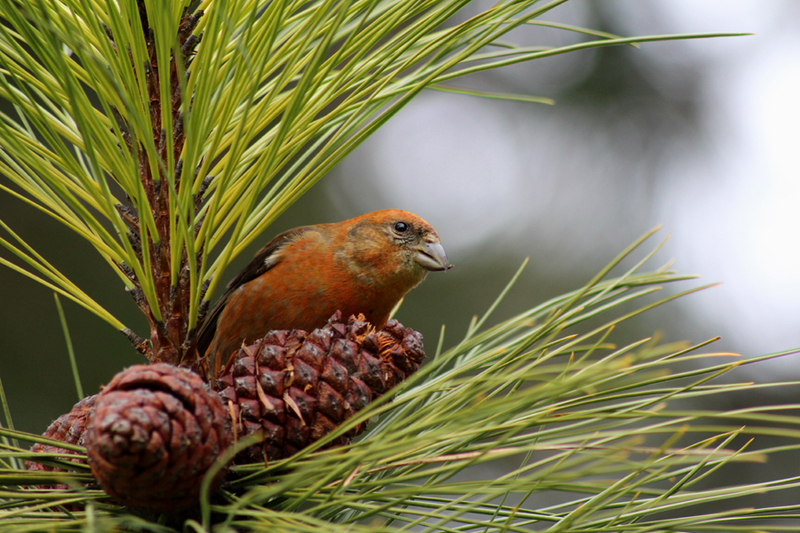 I could have nearly reached out and grabbed this Red Crossbill after it moved one cone closer! And here's the prize the crossbills were using their specialized bills to extract from the cones - amazing!